This event has sold out. There will be no ticket sales at the door. Join us at The Museum of Modern Art for a sunrise gathering in the Agnes Gund Garden Lobby and Abby Aldrich Rockefeller Sculpture Garden featuring live music; participatory art-making stations; an open coffee, juice, and breakfast bar; and exclusive access to Yoko Ono: One Woman Show, 1960–1971. 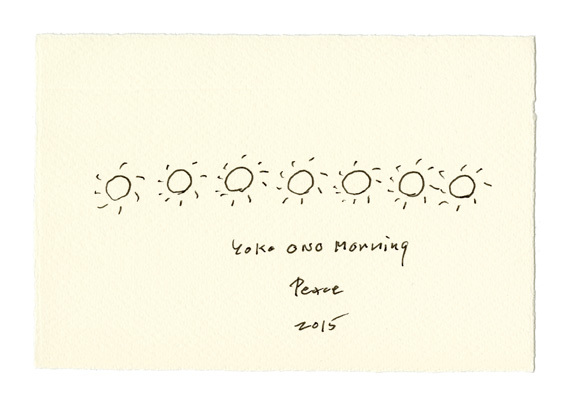 PopRally presents YOKO ONO MORNING PEACE 2015, a global gathering at sunrise on June 21, 2015, celebrating the MoMA exhibition Yoko Ono: One Woman Show, 1960–1971 and the 50th anniversary of Yoko Ono’s New York performance of Morning Piece (1964) to George Maciunas. Morning Piece was first performed in Tokyo in 1964 and again on the roof of Ono’s apartment building at 87 Christopher Street in September 1965. At these events, attendees gathered at sunrise, and Ono sold artworks with typewritten pieces of paper attached to glass and other materials. Each specified a future date and a particular period of morning (e.g., “February 3, 1987 after sunrise,” “January 1, 1972 all morning”). Ono would inform buyers, “You can see the sky through it,” and offer them the possibility of possessing something intangible: a future morning. All participants are encouraged to share their experiences on social media via the hashtag #YokoOnoPeace. 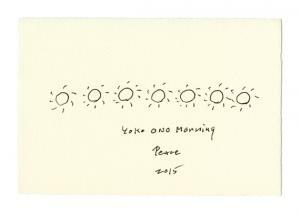 YOKO ONO MORNING PEACE 2015 is organized by The Museum of Modern Art in New York in partnership with the Fondazione La Triennale di Milano (Milan), Garage Museum of Contemporary Art (Moscow), the Istanbul Museum of Modern Art (Istanbul), the J. Paul Getty Museum (Los Angeles), M+ (Hong Kong), the Museum of Contemporary Art Australia (Sydney), and the Museum of Contemporary Art Tokyo (Tokyo). This event is made possible by The Contemporary Arts Council of The Museum of Modern Art. Special thanks to Sud de France Wines for their support of MoMA PopRally. © 2019 ShowClix on behalf of Museum of Modern Art - PopRally. All sales are final. Tickets are non-refundable.